The state flag of Kansas shows the state seal, which shows a rising sun and the 34 stars symbolize the states that were in the Union in 1861. The state seal shows a ploughman preparing the field for planting while the native wild sunflower, which was adopted as the state flower in 1963 is shown on the blue field in a golden wreath. Our Kansas state flags are 100% made in USA and industrial grade flags that are made to precision and beauty. 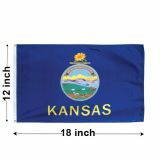 Available in a variety of sizes, materials and mounting options, Kansas flags from Tuff Flags are perfect to show your state pride and the love of its hospitable folks for BBQ, basketball and patriotic pride among others! 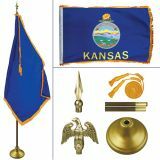 Shop from our complete line of Kansas Flags right away and avail the best prices, quick shipping and much more! 100% customer satisfaction guaranteed! Kansas ranks as one of the most patriotic states in the country and it takes the credit of being the host state of the first Veteran’s Day. Show your patriotic pride and the love for the vibrant state of Kansas with our complete line of Kansas state flags. Be it the light weight yet durable nylon outdoor flags or the thick and durable polyesters flags for the high wind areas or still the beautifully crafted indoor flag kits or more, we have all your flag requirements covered. Made from superior quality materials, our flags are finished with grommets and headings and UV resistant imprints that will impart a long lasting beauty to your flag presentation. Our nylon indoor flags are available in both plain and gold fringed models to cater to your diverse flag flying needs. If you need to set up an impressive flag display in front of your distinguished guests, check out these indoor flag kits that come with flags, tassels, ornaments and pole. Show your identity and the love for your state with our Kansas flags that enjoy 6 months guarantee on construction. Browse our selection of Kansas Flags and choose a model that matches your budget and needs. Need help? Feel free to call us at our toll free number (888) 287-3524 or email us at customercare@tuffflags.com.